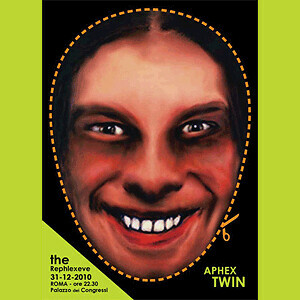 Aphex Twin will be playing a special New Years Eve show at the Palazzo dei Congressi in Rome. Anyone going to this? It's going to be huge. [Aphex Twin] "has just separated from his wife, with whom he had married in a wedding held on the last day of the year. He then wanted to make a party in a beautiful place to forget the recurrence of this anniversary." "The night was also meant to be given to people with hearing problems, and as such must be fitted with the speakers that reproduce low frequencies also noticeable physically through vibration. To do this, handed out balloons are inflated, held in his hands,-will act as a buffer, allowing all the perception of sound."